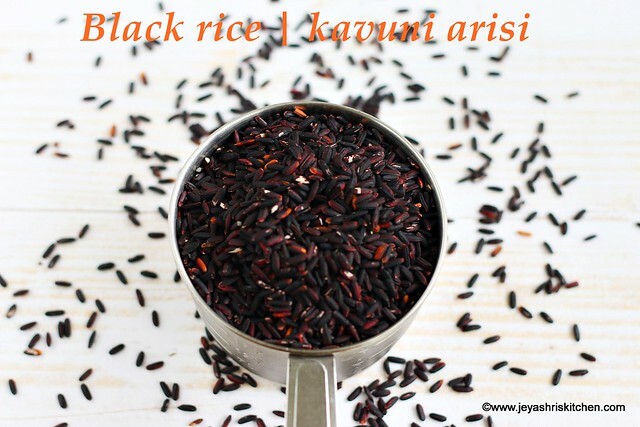 Kavuni arisi | black rice | karuppu arisi, is similar to the glutinous rice, which we use for Thai sticky mango rice. The only difference is in the color. The rice originally was produced in Burma but the one i got is an Indonesian product. This black rice is quite popular in the South east Asian countries. Though i have heard about this rice from my friends many times, never attempted to try this at home. We get this black rice quite commonly in all shops like Fair price shops and small Chinese, malay, grocery shops too. 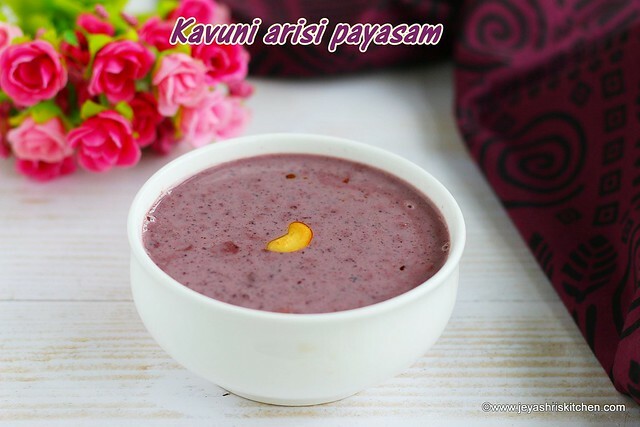 Yesterday during my morning walk, a friend of mine suggested me to try this Kavuni arisi payasam and shared the recipe with me too. She told she makes it quite often and it is a huge hit among her friends too. So i grabbed a small packet from the nearby shop and tried this payasam. While discussing about this with another friend of mine, she told few variations too. The payasam was very aromatic and we enjoyed it very much. Try this as a neivedhyam to God for this Navaratri and serve your guests also a different and unique dessert. Check out my complete collection of navratri recipes. Wash and soak the rice in 3/4 cup of water for 7 hours or overnight. After 7 hours keep the water aside and grind the rice coarsely. Add little water while grinding. In a heavy bottomed pan or a pressure cooker, add 3 cups of milk and the ground rice paste. Add the remaining water, which we used for soaking. Keep the flame to low and start stirring it. The mixture will start thickening and also ensure not to get it burnt. After 20 minutes, switch off the flame and sugar. If adding condensed milk add now. You can reduce the sugar if adding condensed milk. Fry the cashew nuts in ghee and add it to the payasam. You can add cardamom powder if you want, but i want to enjoy the flavor of the payasam, so i didn't add cardamom. Do not forget to soak the rice as it will not get cooked easily. You can soak the rice and pulse once and proceed to make the entire process in pressure cooker as how we make paal payasam. Adding condensed milk enhances the richness of the payasam. You can add 1/2 cup thick coconut milk towards the end, after adding sugar.